Most word processors are designed for literate adults. Clicker Writer is designed for children who are learning to read and write. It will grow with your students as they develop their skills, making it the ideal word processor for the elementary classroom. Students type into Clicker Writer from the keyboard, or use Clicker Grids to enter words and pictures, so you really can use it across your age and ability range. Clicker Writer helps learners find and correct errors and grow in independence and confidence by providing automatic speech feedback as students write. Each sentence is automatically read out as it is completed, with every word clearly highlighted as it is spoken, enabling learners to follow the text and review what they have written. Research shows that this active engagement with text encourages students to find and correct errors for themselves. When you’re using pictures from Clicker Grids, or the “Instant Pictures” feature, pictures are displayed above the words as you write, helping students to read their writing. Use pictures from the Crick Picture Library that comes with the program, or use other picture libraries such as the Mayer Johnson PCS symbols, or your own bank of photos. The child-friendly Sassoon font displays letters in the familiar form that children learn to write. This makes words and letter patterns easier to recognize for early readers. Clicker Writer’s tools use the standard icons that students need to become familiar with. By default, they are displayed at a larger size, making them ideal for early writers. The toolbar is fully customizable, so you can adjust the size of the tools and display just the ones you want your students to use. NEO 2—The Premier Writing Tool Does So Much More! Now students can send their KeyWords data wirelessly from their NEO 2s to NEO Manager on their teacher’s computer using the new KeyWords Wireless app. This new capability makes it even easier for teachers to monitor student progress toward keyboarding proficiency. Existing customers can download and install this app for free. Go to NEO Downloads and download NEO Manager to get started. Renaissance Place customers can now track KeyWords progress through a new KeyWords Dashboard on their RP sites. The KeyWords Dashboard shows at a glance how many students have submitted at least one lesson, as well as the number of lessons passed and practices completed. It is a great complement to the new KeyWords Wireless app. With the addition of the new MathFacts in a Flash (offline) SmartApplet, your students can practice their math facts anytime, any place. No need to be within range of the Renaissance Receiver or have a login to MathFacts in a Flash RP. Students can practice using 62 levels of content covering addition, subtraction, multiplication, division, percents and decimals. Read more. With NEO Share (a free download) running on your computer, you can integrate NEO 2 with interactive whiteboards, projectors, and classroom computers to make the most of what you already have. Read more or view an online demonstration here. If you have an existing subscription to Vantage Learning’s MY Access! software, you can use NEO 2 to submit writing samples wirelessly and receive instant feedback in return. Read more about MY Access!. Study Island, Eduware, Easiteach and PowerZone—these are just a few of the top providers whose content works with NEO 2. Our partnerships are one more reason why NEO 2 is such a great value in the classroom. With NEO 2 in your classroom, you can take Accelerated Reader Quizzes or submit Accelerated Math assignments at any time. Read more about NEO 2’s support for Accelerated Reader software. With NEO 2’s built-in classroom response system, you can engage your students in the learning process while easily monitoring student understanding of the lesson. Read more about using NEO 2 with the 2Know! Toolbar and AccelTest. KeyWords, NEO’s built-in keyboarding curriculum includes language-based lessons that build vocabulary while improving keyboarding skills. Read more aboutKeyWords or View the Keyboarding Video. Send Files Wirelessly…to Google Docs™! Students can send their work wirelessly from their NEO 2s to Google Docs, Google’s online document, presentation and spreadsheet application. Read more about NEO 2s connection to Google Docs. Combining the NEO Text2Speech hardware device with NEO’s built-in SmartApplet software helps students convert any written text into spoken words. Read more. Students can spend more time on task with NEO 2’s wireless printing feature. Just press the print key on NEO 2, and send your documents directly to the default printer. NEO provides up to 700 hours of use on just three AA batteries. Weighing just two pounds, NEO can be easily transported from school to home, where some families don’t yet have access to a computer. Tossed in a locker or jammed into a book bag, NEOs can take what students dish out. No internal moving parts, flip screens, or mechanical disk drives mean that NEOs will continue to function flawlessly even after being dropped. A variety of font sizes can be selected, from two-to-six lines of text, to accommodate students with vision challenges. Aurora Suite 2005 Professional Edition provides access to Aurora Suite’s full feature set for both Augmentative Communication and Learning Disabilities. It is the only edition that includes our full customer support service including one year of access to our experienced telephone technical support and two years of 24-hour automated internet support including updates. If you are looking for the best support, and a full feature set for users with learning disabilities, dyslexia or for augmentative communication, this is the product to choose. To get detailed information and animated examples of Aurora Suite’s many features, have a look at our Aurora Suite 2005 Tour. We also offer a Feature Comparison Chart for the three editions of our product and a list of the key features for Learning Disabilities and Dyslexia, Augmentative Communication, or Speech as well as a brief list of some of the new features in Aurora Suite 2005. In addition to all the features in the Value and Standard Editions, the word prediction in the Professional Edition is enhanced with our most accurate word prediction algorithms,phrase prediction, and supports dictionaries up to 1,000,000 words. For maximal keystroke savings, this is the edition to choose. The word prediction in the Professional Edition also provides the most customizable word prediction list, offering up to 40 words, separate sorting for word completion and next word prediction tasks, cursor following, as well as spacing choices and more. Aurora Prediction is advanced, effective word completion and prediction that learns your writing style, and works with all the applications you need it to. Abbreviation Expansion saves keystrokes by letting you program a short code to type instead of often used phrases. Phrase prediction learns phrases as you type for even more effective keystroke savings than single-word predictors. Grammatical Rules help the word prediction system give you better suggestions. AutoPunctuation, AutoCapitalization and AutoSpacing save keystrokes by typing spaces and capitals where you need them. Phonetic word completion helps guess the word you’re typing even if you spell it wrong. Talking Spellchecker works with any application and is tuned to the needs of the most creative spellers. Homonym alert, definitions, and usage examples for over 2100 homonyms make sure you use the right word. Placing the mouse over a homonym or other macro displays its full text in a tooltip. The Dictionary Editor allows you to edit your dictionary, or even import vocabulary from documents you’ve written to get prediction up to speed on your writing style. Pretrained English word prediction vocabularies from 1,900 to 625,000 words, many including 20,000 common names and places. Additional language dictionaries for UK English, French, German, Italian, Finnish, Spanish, Swedish, Polish and Portuguese. Automatic Spelling Corrections correct common misspellings instantly. Add your own with the touch of a button. For people who have difficulty with next word prediction, it can be turned off. The Prediction window can display up to 40 words to select from. Recently added words can get an additional priority boost. Aurora Prediction can predict abbreviation expansions so you may not even have to memorize the codes. Aurora Talk provides fast and easy conversational speech output for public speaking or day-to-day discussions. Multiple conversations allows you to organize phrases by topic or situation. Permanent phrases guarantee you’ll never have to retype phrases if you don’t want to. Smart paste makes it painless to convert a word processor document into a spoken presentation. Programmable function keys let you store up to 33 of your favourite phrases for fast access. Aurora Echo is a simple screenreader that reads documents, email or web pages when reading is a chore. Read Marked Block lets you use the mouse to mark text in email, web pages, or word processor documents for reading. Read Button or Window turns Aurora Echo into a screenreader, reading anything you put the mouse over. Aurora Echo offers spoken feedback as you type so you can hear if you make mistakes. Echo has a new button to stop the speech synthesizer while it is speaking. Prediction and Talk offer this as a menu item. Run-on-Sentence alert lets you know when it is time to consider adding some punctuation. Punctuation Monitoring reminds you when you start a question, but don’t finish it with a question mark. Microsoft Speech API Version 4 and 5 speech synthesizers are supported making Aurora compatible with nearly all modern software speech synthesizers. Visual Highlighting for speech output, highlighting each word as it is spoken, with complete visual customization of font, size and colors. Pronunciation correction system assures words are always pronounced correctly by the speech synthesizer. Microsoft English synthesizers are included, additional L&H synthesizers for American English, British English, French, Spanish, Russian, Portugese, Korean, Japanese, Italian, German and Dutch are available by download. Feature Editor’s fine grained feature control lets teachers control exactly what help Aurora Suite offers students. 168 page printed User’s Guide covers Aurora Suite’s features in detail. Telephone, Web and Email support assures you won’t waste time finding solutions to any problems you might have. Languages are better supported now that Aurora is user-translateable and all UNICODE. Aurora Suite Professional Edition can be purchased for a single user, or for groups of 5 or 10 users at significant savings. The Professional Edition is also available as the special Aurora Suite 2005 Professional Edition Volume License for installations of 25 or more seats. We offer flexible licensing, such that each licensed user of Aurora Suite 2005 Professional Edition, in addition to the primary installation, may also install the software on a second portable computer. We encourage you to read the License for specific details. Minimum system requirements for Aurora Suite 2005 for Windows are Windows Vista, Windows XP or Windows 2000, a 400MHz Pentium compatible CPU, 64M of RAM, 50M of disk space, and a display resolution of at least 800×600. Speech output requires a windows supported sound card and speakers. Some program features require an internet connection. So what are and who has great ‘study skills’ ? For now, we are going to assume the definition, that ultimately the person who comes out at the end of the exams with the best mark broadly has better study skills that someone who doesn’t. Having good Study Skills implies you actually have many component skills – the easiest way to get students to apply all of them is to have a coach to help them whenever they are ready to study. RecallPlus can be that coach! If you look at a typical student and compare them to a successful student, the successful student is much more likely to be deep into producing drawings and diagrams in his/her notes. See results of Research 2004. It is well known that use of diagrams such as concept maps etc increases learning by about 10-15% compared to an average student’s notetaking methodology. For this reason, a series of excellent software programs have popped up, that specialise in producing diagrams that improve memory. Students who use them have been proven to learn faster. RecallPlus study software is like a super version of a concept map program –> designed to heirachically manipulate sets of diagrams – effectively a set of notes! Notetaking skills – Notes you can revise for exams for are important! Taking notes about information you wish to learn, in a way likely to aid subsequent memory and revision is central to exam success. RecallPlus study software allows you to apply the level of organization to these diagrams that you feel helps you the most – drag and drop sets of diagrams from one place in your notes to another. Easy searching for later use. Good ‘Time management’ should be part of your study method. This is a very broad term, so let us narrow it down to meaning how much time you spend studying during semester vs time spent studying during exam season. What you do with your time AS you are studying. RecallPlus gives you time estimates of how long you will need to study the content you have entered – see how much time you really need! RecallPlus study method includes showing you graphs of what you know well, vs what you know less well. Expert edition will also show you simulations of how much time you will need between now and the exam you are sitting including for notes you have NOT entered into RecallPlus yet! The latest released edition of RecallPlus – RecallPlus Expert Edition, uses data it collects watching you study including your very own forgetting curves, to simulate your study time needs up to an exam. It will give you reports that can tell you how much time you REALLY have!. Optimized revision – study methods advocated to minimize revision with maximum learning! How students should revise optimally is the subject of debate… but internationally, there is agreement for various principles known as far back as the 1980’s. The core one that is known about, and roughly recommended but never used by most students, we are going to refer to as the ‘Spacing Effect’. Briefly it refers to the fact that the optimal way to revise a given piece of information is to space your revisions at an increasing interval. e.g. revise what you have just learnt within 1/2 an hour, then at the end of the day, and then at further, increasing intervals. Here is a link to information on the forgetting curve, the spacing effect, and optimizing revision..
Rather than researching it yourself and then trying to track your revision yourself, why not let RecallPlus minimize your revision for maximum learning! RecallPlus applies optimal revision theories to your study notes and will revise with you again, the information as it becomes due. This is very quick compared to the situation where you leave it too long, forget it and then have to relearn it! Let RecallPlus organize your revision and you will have to do less revising AND know the information better. RecallPlus gives you suggestions during break times, about how to motivate yourself, how to make study fun, how to keep yourself physically ready for study and what sort of environment you need. RecallPlus is there when the student needs it… which is mostly when there is no teacher/parent around! Study methods you use for memorizing things. 1. RecallPlus teaches you these techniques. 2. RecallPlus was designed from the start to allow their application to everyday study. 3. RecallPlus’ tips make further suggestions. How you practically apply these basic tools to the actual tasks you face. e.g. If you check out the Memory Toolbox, you will see that in fact the simple peg method is virtually useless in actual real life tasks compared to the other tools, in particular the story and journey tools. The average student is unable to change what they see as ‘memory tricks’ into actual useful changes to their study techniques. The more you use RecallPlus the way it is supposed to be used… the more students find themselves gravitating to use study methods which are recognizable applications of these memory tools. The memory toolbox gives you examples of how you can apply them to some circumstances, and we are happy to offer you further immediate help if you cannot see how you can apply them to YOUR real life memory tasks. RecallPlus’ memory toolbox, is designed to aid you to change what you learn about memory champions, into your study habit. As implied, the most obvious differences are between multiple choice, written and open book exams. With multiple choice you need only be able to Recognise if something is correct or not, so the key is to read as widely as possible, and do less revisions. With written exams, depending on the style of the exam, you will have to typically do more checking to make sure that the information that you have read is something which you can then recite or work with, than in multiple choice. You should therefore do things like actually test yourself on your material. With open book exams, a mixture of the 2 is required… and you must know the things you are taking into the exam backwards. No matter which type of exam you are looking to pass, past papers are invaluable, and should be done from early in your study period, to the end, so that all the way along, you have checks to make sure the things you are doing are both relevant, and useful. Study skills including Memory, Passing Tests, Cramming ! Environment for study is very important. Guidelines – see Study Environment Virginia Tech .. is excellent. Kindle’s high-contrast E Ink display delivers clear, crisp text and images. Kindle’s E Ink screen reads like real paper, with no glare. Read as easily in bright sunlight as in your living room. No battery anxiety – read for up to one month on a single charge with wireless off and a half hour of reading per day. Kindle is ready to use right out of the box – no setup, no software to install, no computer required to download content. Kindle’s powerful processor is tuned for fast, seamless page turns. Adjustable Text Sizes, Font Choices Kindle has eight adjustable font sizes to suit your reading preference. You can increase the text size of your favorite book or periodical with the push of a button. If your eyes tire, simply increase the font size and continue reading comfortably. 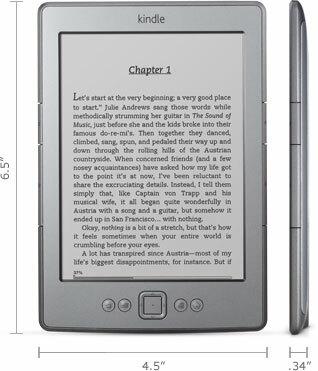 Kindle also has three font styles to choose from – all optimized and hand-tuned to provide the best reading experience. Kindle makes it easy to take your personal documents with you, eliminating the need to print. You and your approved contacts can e-mail documents – including Word, PDF and more – directly to your Kindle and read them in Kindle format. Your personal documents will be stored in your Kindle library on Amazon and ready to download conveniently anywhere at any time. You can add notes, highlights and bookmarks, which are automatically synchronized across devices along with the last page you read using our Whispersync technology. You can read your PDFs in their native format, view them in landscape mode, or zoom in up to 300% to view small print and detailed tables and graphics. You can also convert your PDF document to the Kindle format so that it reflows like a regular Kindle book. Learn more. Come across a word you don’t know? Kindle includes The New Oxford American Dictionary with over 250,000 entries and definitions for free. Kindle lets you instantly lookup the definition without ever leaving the book – simply select the word with the cursor and the definition will automatically display at the bottom of the screen. Your offers display on your Kindle’s screensaver and on the bottom of the home screen – they don’t interrupt reading. You can set your personal Kindle Screensaver Preferences to give us hints on the style and types of sponsored screensavers you’d like to see. Access the Kindle Store wirelessly right from your Kindle – search and shop the world’s largest selection of books that people want to read, plus magazines, newspapers, blogs and games. We auto-deliver all your purchases in seconds – simply search, buy, and you’re ready to read. Kindle makes it easy to discover new titles with recommendations personalized just for you. The Kindle Store uses the same personalized customer experience you’re used to across Amazon.com, matching our best recommendations to your personal reading habits. The Kindle store contains the largest selection of books people want to read: over a million books, including over 800,000 at $9.99 or less. We work directly with publishers to get the latest bestsellers, biggest new releases and the titles most popular with tens of millions of Amazon’s book customers. Over 2 million free, out-of-copyright, pre-1923 books are also available such as Pride and Prejudice and Treasure Island. Learn more. Shop and subscribe to your favorite magazines and newspapers such as Time, Newsweek and The New Yorker, from Newsstand. New editions are auto-delivered wirelessly direct to your device the second they go on sale. Stay up to date with the latest tech stories, sports results and news updates from your favorite blogs. Subscribe to popular blogs such asGizmodo, The Onion and ESPN to receive auto-updates on your Kindle throughout the day. Take a break from reading to enjoy a selection of great games specially designed for Kindle, like Every Word and Number Slide. Kindle features an experimental web browser based on WebKit to provide a better web browsing experience. Now it’s easier than ever to find the information you’re looking for right from your Kindle. Experimental web browsing is free.